"Education, Research, Health Care, Service"
The State University of New York Upstate Medical University (or "Upstate") is a SUNY health sciences university located primarily in the University Hill district of Syracuse, New York. SUNY Upstate is an upper-division transfer and graduate college with degree programs within the College of Medicine, College of Nursing, College of Health Professions, and the College of Graduate Studies. Its Syracuse campus includes Upstate University Hospital. In addition to affiliations with Binghamton Hospital and 22 other hospitals throughout central New York, where much of the core clinical teaching takes place, Upstate has numerous partnerships, including a joint Ph.D. Program in Biomedical Engineering with Syracuse University; science enrichment programs for local youth in tandem with the SC Hope Clinic; and SUNY-ESF. It directly generates 9,849 jobs, making it Onondaga County's largest employer. Upstate's earliest predecessor was Geneva Medical College founded 1834 as part of Geneva College, today known as Hobart and William Smith Colleges. 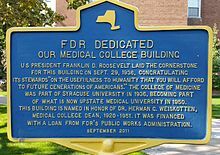 The new medical college was located in Geneva, New York, and became the first college to grant a full M.D. to a woman, Elizabeth Blackwell, in 1849. In 1871 the college was disbanded and its assets donated to the recently founded Syracuse University, which subsequently founded a medical college. In 1950 Syracuse University sold the college to the State University of New York (SUNY), where it remains today. 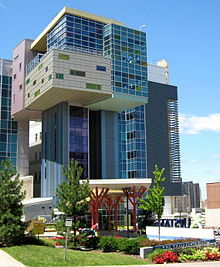 After carrying the names "SUNY Upstate Medical Center" (initially) and "SUNY Health Science Center at Syracuse" (1986), the institution was renamed to its present nomenclature in 1999. A clinical campus in Binghamton, New York, was established in 1979. A plaque in the lobby of Weiskotten Hall, named for Herman Gates Weiskotten, aptly describes one of the institution's driving philosophies: "Dedicated to all those of scientific mind and investigative spirit who purpose to serve humanity." The university's main campus is located in the University Hill neighborhood of Syracuse, New York flanking Interstate 81. It includes Upstate University Hospital, the Institute for Human Performance, Setnor Academic Building, Central New York Gamma Knife Center, Jacobsen Hall, Regional Oncology Center, Upstate Golisano Children's Hospital, Weiskotten Hall, the Health Sciences Library, Silverman Hall and Geneva Tower residence hall. A clinical campus in Binghamton, New York was established in 1979. Medical students spend their first two years of medical school in Syracuse, New York and then approximately a quarter of the class completes their training in Binghamton. The College of Medicine is one of the oldest medical schools in New York. More physicians practicing in Central New York received their training here than at any other medical school. Upstate ranks eighth nationally for the number of graduates who are on the faculty at academic medical centers across the country. The College of Nursing offers a bachelor's degree for RN prepared nurses and graduate programs in: Pediatric Nurse Practitioner (MS), Family Nurse Practitioner (MS), Family Psychiatric Mental Health Nurse Practitioner (MS), and Doctor of Nursing Practice (DNP). The College of Health Professions is the gateway for students seeking to enter some of the most competitive and highly paid careers in health care today: Physician Assistant (MS), Physical Therapy (DPT), Cardiovascular Perfusion (MS), Medical Technology (BS and MS), Medical Biotechnology (BS), Radiation Therapy (BS and BPS), Respiratory Therapy (BS), Medical Imaging/Radiography (X-ray)(BS), and Ultrasound (BS and BPS). The School of Graduate Studies is known for its basic science education and research. Students have the opportunity to work side by side with neuroscientists and basic researchers. The university operates the Southern Tier Center on Aging in conjunction with the SUNY Binghamton. Mantosh Dewan, MD, was appointed Interim President of Upstate Medical University, effective December 23, 2018. Elizabeth Blackwell, M.D. - First woman in the United States to be awarded the degree of Medical Doctor. Founder of The New York Infirmary, now Lower Manhattan Hospital. Thomas Bramwell Welch, M.D. - British–American minister and dentist. ^ "U.S. and Canadian Institutions Listed by Fiscal Year 2017 Market Value of Endowment Assets and Change* in Endowment Market Value from FY2016 to FY2017," NACUBO.org website. Accessed: 29 December 2018. ^ a b Mulder, James T. (2018, November 15). "Psychiatrist named interim president of Upstate Medical University," Syracuse.com. Accessed: 28 December 2018. ^ "About Mantosh Dewan, MD," Office of the President, SUNY Upstate Medical University website. Accessed: 28 December 2018. ^ "Upstate Medical University," College Navigator, National Center for Educational Statistics. Accessed: 29 December 2018. ^ a b c d "SUNY Upstate Facts at a Glance," Upstate website. Accessed: 26 June 2018. ^ a b c "Upstate Medical University," National Center for Educational Statistics website. Accessed: 29 December 2018. ^ Center State Corporation for Economic Opportunity. (2010, November), "Major Employers in Onondaga County." Onondaga County website. Accessed: 1 July 2018. ^ Luft, Eric v d (2009). SUNY Upstate Medical University: A Pictorial History. Gegensatz Press. ISBN 9781933237350. ^ "Southern Tier Center on Aging". SUNY Binghamton. Retrieved 2010-10-17. Luft, Eric von der (2005). SUNY Upstate Medical University: A Pictorial History. North Syracuse, New York: Gegensatz Press. ISBN 1-933237-34-1. Wikimedia Commons has media related to State University of New York Upstate Medical University. This page was last edited on 22 March 2019, at 23:31 (UTC).